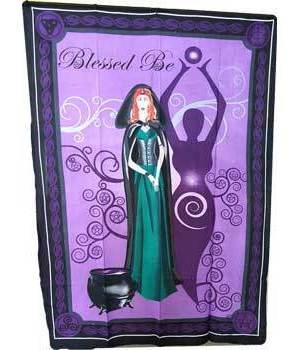 Shop > Magical Clothing | Wiccan Clothing > Tapestries > Goddess Cerridwen Tapestry 60" x 90"
Blessed Be" shows at the top of this tapestry. The design includes a cloaked priestess or the Goddess in corporeal form and Goddess spirit silohette along with cauldron and artisitic design. Celtic boarders and the backgrounds are varying shades of purple. 100 % cotton.